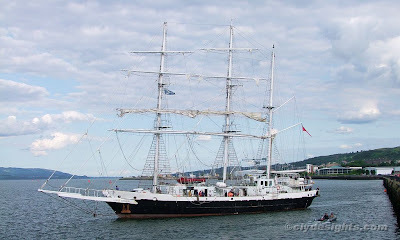 After lying overnight at Customhouse Quay, the Jubilee Sailing Trust's LORD NELSON set off from Greenock in the late afternoon for Lochmaddy, on the first leg of a short voyage to Aberdeen. After a few days at Aberdeen, LORD NELSON will be heading course for the Baltic Sea, and the Polish port of Gdynia, where the Tall Ships Race 2009 is being held. She is due to arrive there on 2nd July.